For the first column of 2015, I look at a few interesting questions. I show a couple of ways to have two songs always play together in shuffle mode; look at a question regarding high-resolution files, Apple Lossless, and iOS devices; and I field two questions about adding information to the Lyrics tag of audiobooks files (and how to export text from that tag). Q: When I play music in shuffle mode, how do I keep two songs together so they always play back to back? Unfortunately, you can’t do this when playing the tracks in iTunes. But there are two ways you can manipulate your music files to get this to work. The first thing you can do is join the tracks when you rip a CD. To proceed, insert a CD in your optical drive (most likely an external drive, since modern Macs don’t have internal drives). View the CD in iTunes before importing it, select the two (or more) tracks you want to join, click Options, and choose Join CD Tracks. You can join two or more tracks in iTunes when you rip a CD. If you’ve already ripped or downloaded the tracks you can use Doug Adams’ $5 Join Together. While many people use it to join audiobooks into single, long tracks, there’s no reason why you can’t use this app to join two or more songs. In both cases, you should rename the joined tracks to show the names of both songs. That way you can find them when you search for either of the songs. In the screenshot above, after I’ve ripped the CD, I’ll rename the joined track Scarlet Begonias > Fire on the Mountain. Q: I purchased some high-resolution music files from an online vendor in FLAC format (96 kHz/24 bits). I converted them to Apple Lossless, imported them into iTunes, and they play fine in iTunes. I’ve created AAC versions for my iPhone, where they also play perfectly. But on my iPad, I want only lossless files and iTunes won’t sync the Apple Lossless files I created, saying that they’re not compatible with the iPad. How come? I thought it could play all Apple Lossless files? As you point out, your Mac can play high-resolution files if you use USB or Toslink digital optical audio, and connect the computer to a DAC (digital-analog converter). As for iOS devices, they will play Apple Lossless files as long as they’re 16-bit. Given that your files won’t sync to your iPad, it’s clear that when converting them from FLAC to Apple Lossless you kept their original sample and bit rates, which aren’t compatible with the iPad. Since you want the keep the 24-bit files in iTunes, you'll need to have another set of files to put on the iPad. iTunes can convert files on the fly when syncing the tracks to your iPad. This reduces both the bit depth from 24 to 16 bit, and the sample rate from 96 kHz to 44.1 kHz, but the resulting files are in the AAC format. Regrettably, iTunes can’t convert 24-bit Apple Lossless files to 16-bit Apple Lossless files while syncing. Your only solution—and it gets a bit complicated—is to convert the 24-bit high-resolution lossless files to 16-bit lossless files and then sync those to your iPad. You’ll end up with two copies of each file in your iTunes library, though, and given the size of lossless files, this could be problematic. You could use iTunes to convert the files, by changing the Import Settings, available from the General preferences, to Apple Lossless. But I would do this outside of iTunes, using the free XLD. 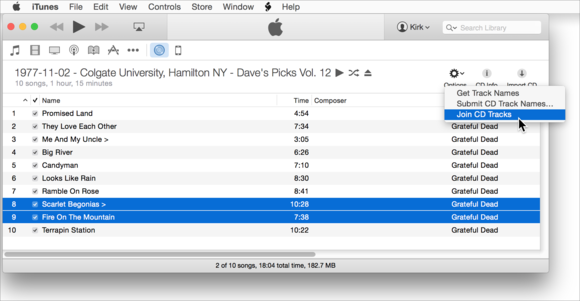 Once you’ve converted the files, you can drag them into a new playlist in iTunes. You can then edit their names (or some other tag, to make sure you know which file is which) and then sync those Apple Lossless files to your iPad. Q: I have a lot of audiobooks in my iTunes library, and I like to add information about them in the Lyrics tab of the Info window. But in iTunes 12, there is no Lyrics tab for audiobooks. Is there any way I can add information to audiobooks as I did before? You’re right, when you select a file and press Command-I to display the Info window, you don’t see the Lyrics tab in iTunes 12. 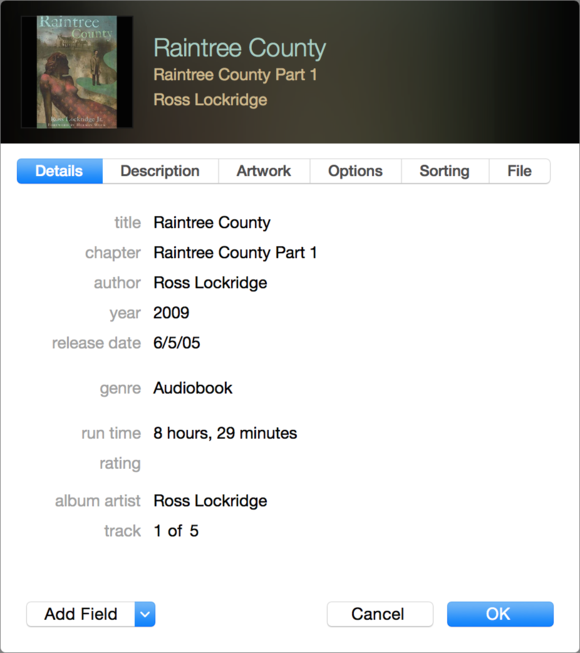 Here’s iTunes 12’s default info window for an audiobook. But there is a way to access this field. Select a file, press and hold the Option key, right-click on the file, and then choose Get Info. You'll see the old Info window, where you can add and access lyrics for any type of file. Here’s the old-fashioned info window, with the Lyrics tab selected. Note that the Lyrics tab is dimmed for audiobooks that I’ve purchased from Audible, but not for audiobooks bought from the iTunes Store. 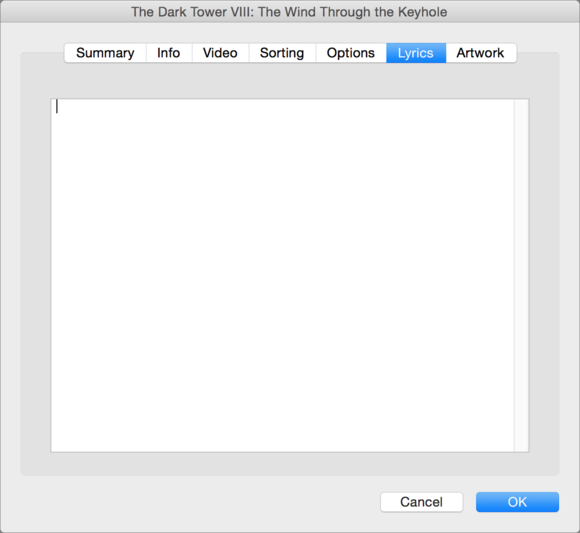 Q: Is there any way to export all the lyrics from tracks in your iTunes library? This was a follow-up to the above question about adding text to the Lyrics tag for audiobooks. iTunes can’t do this, but once again, Doug Adams comes to the rescue with an AppleScript, Lyrics to TextEdit. However, because of a glitch in iTunes, the script can’t read the Lyrics tag of audiobook files. To use the script with music files, select one or more files in iTunes and then double-click this script to run it in AppleScript Editor. The script will copy the lyrics from the selected files (if they do, indeed, contain lyrics) and then open a new text document for each track. Each file is named with the name of the song (or audiobook), and contains all the contents of that track’s Lyrics tag. If you want to use this with audiobooks, create a new playlist and drag all your audiobooks to it. Select all the files, and then press Command-I. Click the Options tab, change the media kind to Music, and click OK. You can now run the script to get the lyrics, as the files are now music files. After you’ve extracted the text from the Lyrics tab, select all the files and change them back to Audiobooks from the Media Kind menu.